HauteLook Lounge featured chic, custom décor by interior designer and Haus interior owner Nina Freudenberger, furniture courtesy of Desiron and wallpaper courtesy of Hinson. 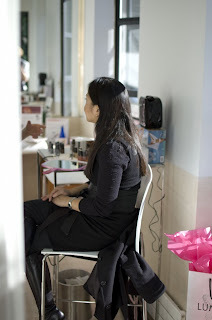 Found this picture of me on bespoken4.org, getting airbrushed with the Luminess Air system. 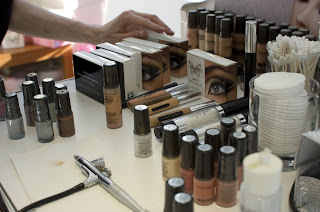 I was looking forward to visiting the HauteLook Lounge again, a temporary escape from the Mercedes-Benz Fashion Week tents and off-site shows, if not to check my email then to get my makeup touched up, get a drink and pick up some goodies. I'm glad I took the time to meet with HauteLook's partners and find put more about their products. 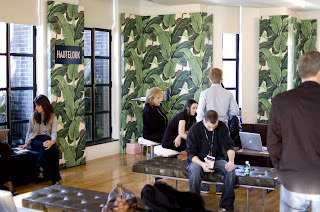 Thursday, February 18th was the first day HauteLook opened up, at the Bryant Park Hotel. I am most excited about trying out my airbrush system, compliments of Luminess Air. I had never gotten my makeup airbrushed on before and decided to give it a try. I expected it to feel like a heavy coating, but it felt light and natural, like my own foundation. It went on like a fine mist, with less effort than applying foundation with your fingers or brush. I loved how quick and easy it was, and how evenly it went on - absolutely flawless. Not only can you airbrush foundation, but you can also airbrush on blush, bronzer for a soft glow and a little shimmer as a highlighter. Not only did Kristen, makeup artist for Luminess Air, do a fantastic job of airbrushing my makeup, she was also very helpful in teaching me how to airbrush the foundation on myself. I was told I was the first person that day to brave trying it out on my own. I held the stylus correctly on my second try, in which you hold it like you are holding a pen. Then you place your index finger on the throttle button and gently push back and spray in a circular motion. I can't wait to try my air system out at home! To be honest I haven't been applying foundation on a regular basis because I am always running out of my house in the morning, but what's an extra minute with a quick spray here and there? Stephanie was also very helpful in explaining the Luminess Air system to me - Thank you! I'll definitely let you know how I do with using it on my own! Also at the lounge was Exhale Spa, who I am familiar with through Spa Week but have never been to before. I didn't have time for a facial at the lounge so I can't wait to try out their 60 minute True Facial at their spa. Exhale Spa gave away complimentary GRN Blue Chamomile Facial Cleanser and GRN Bearberry+ White Tea Mask. Actifirm has partnered with Exhale Spa, gifting lounge guests with an Actifirm Discovery Kit, including an antioxidant cleanser, renovation serum, actimoist booster, and 10% z-peel.